At least 11 civilians have been killed in an airstrike in Afghanistan’s Helmand province, local media report. The NATO-led mission has confirmed to RT that it recently conducted airstrikes there, but claimed there is no evidence civilians were killed. The alleged airstrike took place in the Sangin District of Helmand province late Thursday or early Friday, according to Afghan media. “There has been fighting in and around Sangin over the last few weeks, and US Forces have conducted strikes to support and defend our Afghan partners. As with all claims of civilian casualties, we will investigate them to determine the facts and whether civilians were hurt or killed as a result of our operations,” Charles Cleveland, a spokesman for NATO-led Resolute Support, told RT in a statement. “With that said, we have no evidence that civilians were killed in these strikes, rather just claims from the Taliban that civilians were killed as a result of our strikes in Sangin,” he said. 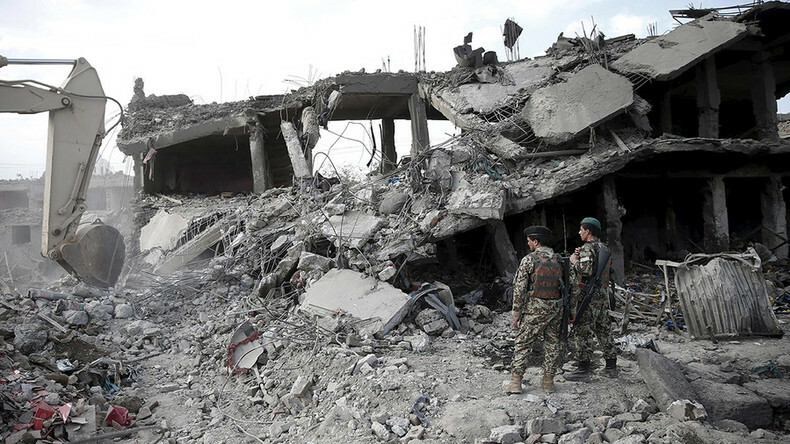 In the meantime, United Nations Assistance Mission in Afghanistan (UNAMA) said it was looking into “reports of civilian casualties” “from airstrikes” in Sangin. Earlier, Pajhwok Afghan News agency cited the Taliban, which claimed that over 20 civilians had been killed and scores wounded in airstrikes conducted by “foreign forces” in Sangin. The group also reportedly said that B52 long-range strategic bombers had been involved in the operation. However, in a statement on the Twitter account of the Resolute Support mission, Cleveland said that B52s had not been used in the Helmand operation.Officials confirmed on Friday that at least 11 members of one family, including eight men and three women, were killed when a rocket hit their house in the Sangin district on Thursday night, according to TOLONews. According to RT contributor Bilal Sarwary, who spoke to Helmand province’s chief and locals, two families suffered in the airstrike, and the death toll reached 25 people. “Two families were affected by this airstrike. Two homes were hit, killing at least 25 civilians and injured six others,” he said, adding that the casualties include women and children. Mohammad Karim Atal, the head of Helmand’s provincial council, told the channel that 11 members of one family were killed in the airstrike, though he said it was not immediately clear which forces had carried out the airstrike. 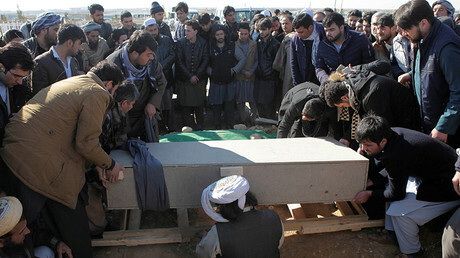 The Afghan army will also be investigating the incident, Atal said. On Thursday, US Army General John Nicholson told the US Senate Armed Services Committee said that NATO should boost its troop presence in Afghanistan. Catherine Shakdam, from the Shafaana Institute of Middle Eastern Studies, told RT that while Washington is vocal about other counties’ mistakes, it fails to notice the beam in its own eye when it comes to civilian deaths. “They are always very quick to kind of throw the blame, or throw other countries under the bus, when it comes to collateral damage, when civilians are involved, but when it comes to their own airstrikes and their own intelligence no one is allowed to hold them accountable for anything,” Shakdam said. Shakdam argued that, although US military occasionally admits to hurting civilians, the mere admission of guilt does not make much difference. “You can’t have an admission of guilt without some form of reparation, because otherwise you are actually robbing people of justice,” she said. About 8,400 US troops and about 6,400 NATO soldiers remain in Afghanistan since NATO sharply reduced the number of its troops there in 2014. US-led forces entered Afghanistan to remove the Taliban from power more than 15 years ago following the September 11 attacks.